In October 1934, there was a shift towards a more conservative and even a more fascist leaning government in the Spanish state. People came to power who were antagonistic to the basic principles of the Second Spanish Republic. This generated a revolutionary spirit across the entire state, which would have its maximum expression in Asturias and Catalonia. 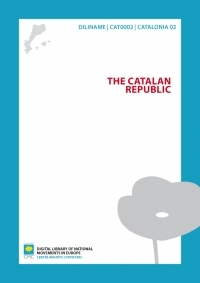 In the case of Catalonia, on the 6th, the regional government, the Generalitat of Catalonia proclaimed a Catalan State within the Federal Spanish Republic. The initiative failed due to a lack of popular support and the loyalty of the Army to the centralised government of the Republic. The subsequent repression led to the detention of 30,000 militants and leaders of left-wing parties, which included Lluis Companys, president of the Generalitat of Catalonia and his government. Political centres were closed, newspapers were suppressed, there were evictions of agricultural workers and the Statute of Catalonia was annulled until the electoral triumph of the Front Popular (Popular Front) in February 1936. With the victory of the Esquerra Republicana of Catalonia in the municipal elections of the 12th April 1931, Francesc Macià, on the 14th April, proclaimed “the Catalan Republic in the hope that the other peoples making up Spain will similarly declare their own republics and form the Iberian Confederation”. This happened shortly before the Second Spanish Republic was proclaimed in Madrid. 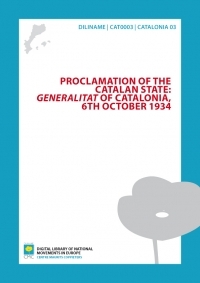 This proclamation worried the provisional Spanish government, which initiated a process of negotiation with Catalonia that culminated in the creation of a new autonomy personified by the restoration of the Generalitat of Catalonia, governed by an Autonomy Statute. The National Executive of Eusko Alkartasuna elected at the Congress of June 2009 promised to analyse the political situation and create a plan with support from members, sympathisers and representatives from university, culture and other Basque social areas. On 21st November 2009, the General Secretary of EA, Pello Urizar, presented in Donostia the "Draft proposal by Eusko Alkartasuna to expedite a sovereign agreement favouring the independence of Euskal Herria". It is directed at all social independentist political parties, it favours unity of action in a strategic convergence based on defending the Basque people’s right to decide with the aim of achieving a new legal-political framework, as the only way of finding a permanent solution to the conflict, achieving peace and political normalisation. By overcoming separatism and fragmentation of Basque nationalism, joining forces will allow the social reality of the abertzale majority to be transferred to the institutions, distorted by the Law of Political Parties, and achieve the complete sovereignty of Euskal Herria exclusively through peaceful means. On a short to medium term it encourages a vast popular movement, strengthens international relations, studies proposals that will allow social authentication of the independentist sovereign convergence and democratically force the French and Spanish governments to recognise Euskal Herria. Copyright © 2019 Diliname. All Rights Reserved. Centre Mautits Coppieters. Template by JoomlArt. Webmaster: Manoel Santos.